Two transparent structures in Ouagadougou and Johannesburg housing seats of government symbolise a radical shift in the status quo of political power on the African continent, attempting through the use of creative spaces to respond to the emergence of a new type of African who looks to new ways of living in which all people have access to all aspects of society. In the face of mounting uprisings, revolutions and social movements from the Cape to Cairo over the last decade, the idea of absolute power and authority of any given government is changing on the African continent. Amid continuous calls for better and more efficient systems of governance, coupled with increased participation on social-media platforms, Africans are demanding to be included in the decision-making processes that affect their daily lives. As such, the need for a new type of institutional architecture that is responsive to and reflective of a rapidly shifting modern society is inevitable. The notion that a glass house can accommodate a seat of government brings to the fore a new architectural trend that is ostensibly socially, culturally and politically responsive. The making transparent of government buildings extends through architectural design the core function of these seats of governance to actively include the broader communities they serve. This idea of transparency is demonstrated in the design proposal for the Burkina Faso National Assembly and Memorial Park in Ouagadougou by Diébédo Francis Kéré, and in the newly completed New Johannesburg Council Chambers in South Africa designed by Pierre Swanepoel of StudioMAS. Both buildings symbolise a radical shift in the status quo of political power. Kéré’s proposal for the new National Assembly building in Ouagadougou was the result of a civil revolution that saw ordinary Burkinabe overturn almost three decades of dictatorial rule, while in Johannesburg, the New Council Chambers is, one could argue, a deviation away from apartheid-era architecture, which was intended to be dominant and exclusive for a select group of people, towards an architecture that is inclusive and embraces all people in democratic South Africa. In the Burkina Faso National Assembly building, the tree is used as a symbolic reference to a place of gathering and communal decision-making, while the idea of the lekgotla (village assembly) and the African drum are represented in the Johannesburg Council Chambers. In their representations, both buildings proclaim the need for transparency in government, and the inclusion and recognition of African-centred knowledge systems, symbols and traditions as alternatives to the Eurocentric trends that dominate the representation of these buildings on the continent and globally. In October 2014, the Burkinabe uprisings formed the backbone of a revolution that was organised by civil society as a series of demonstrations and riots, and spread through several cities in Burkina Faso. The uprisings were in response to attempts by former president Blaise Compaoré to extend his almost three-decades-long rule by changing the constitution. The uprising resulted in the desertion of the president and the destruction of several government buildings in Ouagadougou, one of which was the National Assembly building. This destruction was arguably an act of violence against symbols of a government that was perceived as being representative of established hierarchies of power and not the people. The transitional government that was subsequently formed invited internationally acclaimed Berlin-based architect Diébédo Francis Kéré, who happens to be native to Burkina Faso, to propose a design for a new National Assembly building. 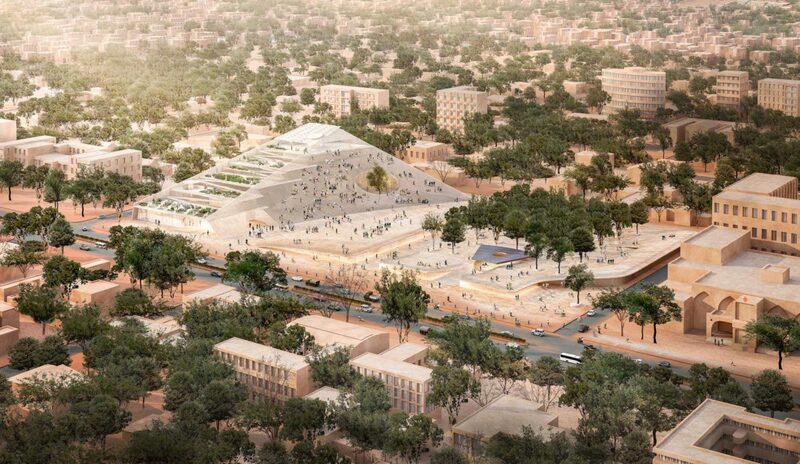 Kéré, who has gained a reputation for his creative people-centred approach, proposed a design for the 127-seat National Assembly and adjacent Memorial Park that was not obviously in his recognisable simple and unpretentious style but which did bring the traditions of the Burkinabe community into what is the most important building in the country. Vision for the new parliament building in Burkina Faso. The tree is used as a symbolic reference to a place of gathering and communal decision-making. © Kéré Architecture. Vision for the new parliament building in Burkina Faso. The tree is used as a symbolic reference to a place of gathering and communal decision-making. Images by Kéré Architecture. The arbre à palabres, or tree of discussion, sits adjacent to the main assembly chambers in a private garden. Visible to the public through the transparent facade, the tree reinforces the Burkinabe tradition of decision-making under a tree in full view of the community. Like the canopy of the tree, the ziggurat structure shelters the National Assembly chambers. Terraced green platforms offer public spaces on which the community can gather and ‘observe’ the decision-making processes taking place. The platforms also house agricultural plots as a celebration of the Burkinabe tradition of subsistence farming, while at the same time allowing for the possibility to showcase innovative methods of sustainable-agriculture practices. In a typical Kéré gesture, the design proposal was intensively workshopped in and with communities in Ouagadougou, locating the proposal in the zeitgeist of the time and in response to the needs of society. This process sparked public debate and allowed the Burkinabe to appropriate and claim for themselves a place in the seat of power in Burkina Faso. 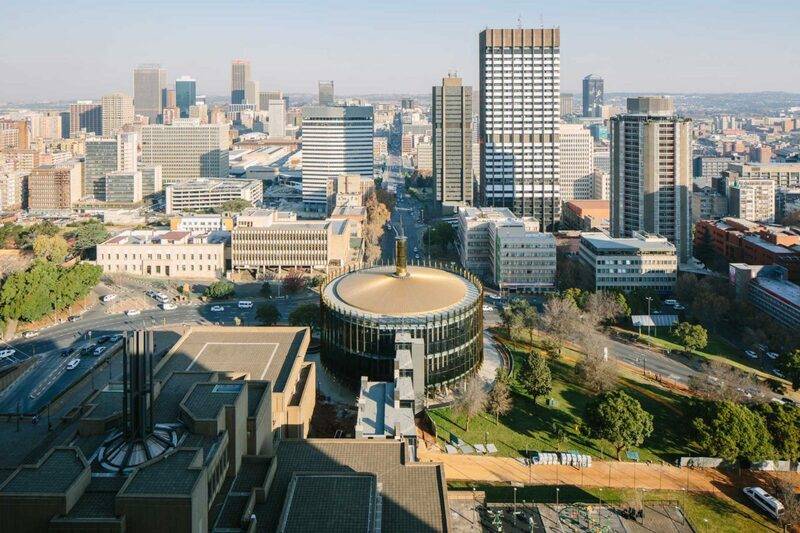 Completed in May of this year by StudioMAS, the New Johannesburg Council Chambers, sited on top of Braamfontein koppie (hill), is an open and inclusive public space in which people interact freely with the city’s seat of governance. This is in stark contrast with apartheid-era institutional architecture, which was characterised by its closed, exclusive and imposing nature. In a city where a collection of European styles – Cape-Dutch, Victorian, Art Deco and more recently Tuscan – has come to dominate, the cylindrical form of the Council Chambers, which references both the circular lekgotla and the African drum, has introduced a new style of architecture. 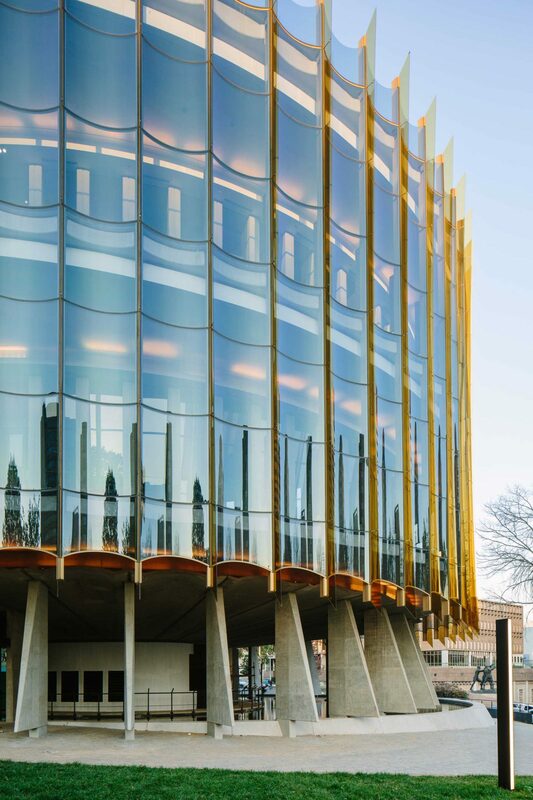 The curved glass facade allows for a direct visual connection between the council and the city, with council members looking out over the metropolis, and the city looking into the chambers while council is in session. The symbolism in this dual transparency talks to the aspiration of the government to form an irrevocable connection between the Johannesburg Metro Council and the city it governs. Johannesburg’s new Council Chambers overlooks the inner city. The gold fins repeated as lines within the reflection of the city on the facade exposes the connection and celebration of Johannesburg’s history of and association with the precious metal. A centralised service core elevates the building, lifting it clear of the ground and exposing its concrete vaulted underbelly. The People’s Square, the public viewing area, is separated from the adjacent chambers by a perimeter lap pool, which serves as a passive security measure while at the same time softening the beautifully harsh and brutal concrete-work of the underbelly and service core. The public gallery is accessed via an internal stoa (covered walkway) that winds up three storeys, at every level taking in a different view of the city of Johannesburg. Lining the stoa are 134 totems, made from indigenous kiaat wood and designed by a community member from every ward in the Metro of Johannesburg, speaking to the Tswana tradition of bringing into the lekgotla a representation of the collective. 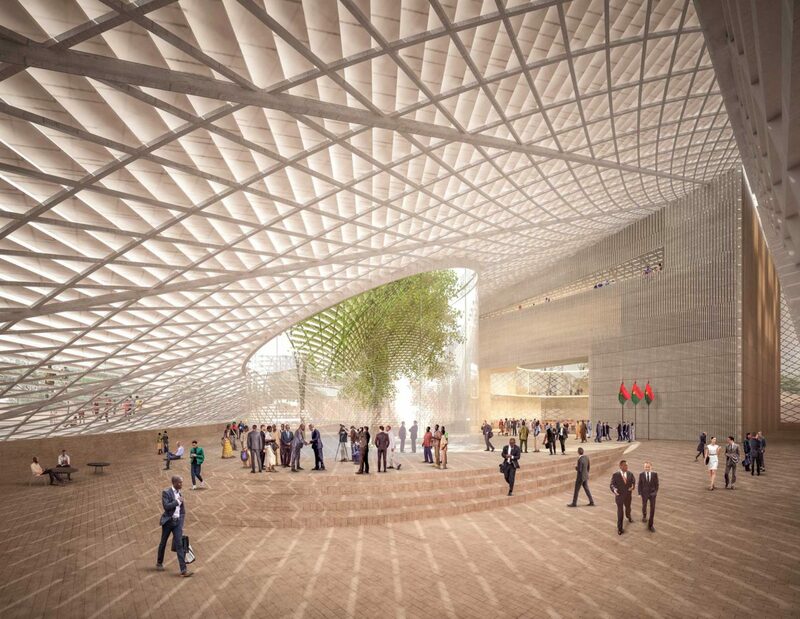 The architectural design proposal for the Burkina Faso National Assembly was exhibited at the 2016 International Architecture Exhibition at the Venice Biennale, the theme of which was ‘Reporting from the Front’. Curated by Pritzker Prize-winning architect Alejandro Aravenabe, the exhibition was an investigation into the role of architects in the battle to improve the living conditions for people all over the world. Kéré Architecture contributed a design report on government architecture and its accommodation of society, and how architects and architecture can resolve or alleviate the issue.